My work has been published in TIME, America, Commonweal, Sojourners, Busted Halo, Huffington Post Religion, On Faith, Indianapolis Star, Loyola Press blogs, and other outlets. Below is a near-full list of my published work. This piece drew the attention of Robert Spencer and Pamela Geller, the anti-Muslim activists I discuss in the piece. Spencer wrote a post on his blog attempting to discredit me, which Geller and other Islamophobic websites also shared. The article also garnered positive attention in the media, with Al-Jazeera and a New Hampshire radio show quoting from the piece extensively. Wait, I thought that was a Muslim thing?! Excerpt: “The video claims that engagement and evangelization are at odds. But as a devout Catholic, I don’t see it that way. …For me, dialogue with the Muslim community during my years at Georgetown University hasn’t pushed me towards conversion nor pulled me away from my tradition. It has actually made me a better Catholic.” Read more. Excerpt: “This kind of dialogue challenges the assumption held by many believers who feel that engaging with people of other faiths forces us to sideline aspects of our practice, water down our doctrines, and drop our distinct identities. But the dialogue in which I participate and promote doesn’t ask us to compromise on or abandon our differences; it thrives on the sharing of them.” Read more. Excerpt: “Islam, a faith not my own, became the medium through which I came to love the faith of my childhood. But I think immersion into any other religious tradition would have helped me in the same way: raising questions and presenting alternative viewpoints that allowed me to reflect back on Catholicism with new perspective and a curiosity to learn more.” Read more. For six years, I reported for Y-Press, a youth media organization in Indianapolis. Written from a youth perspective, my Y-Press pieces range in topic from the legacy of the Rwandan genocide, Muslims’ perspectives of Barack Obama’s candidacy, and political and social activism in the United States. A link to most of my print articles can be found here. Links to my radio and audioslideshow pieces can be found below. 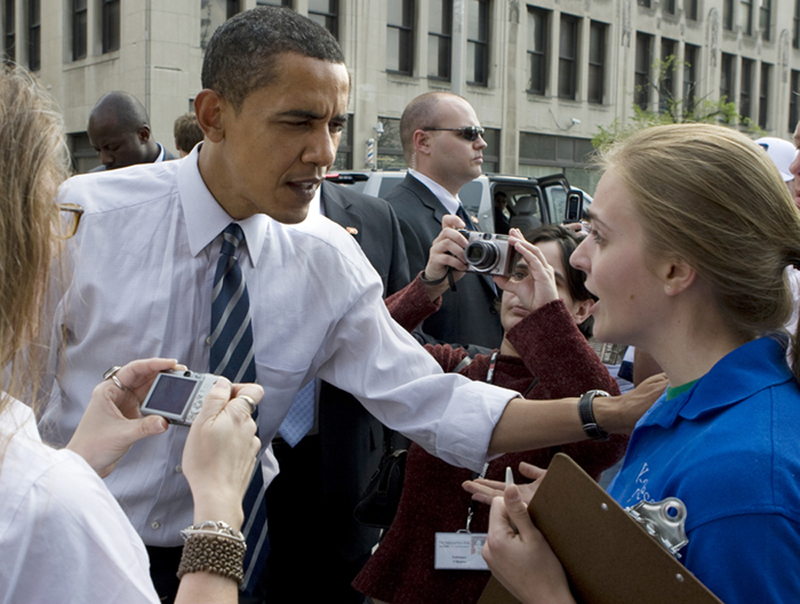 My interview with Obama in Indianapolis in Spring 2008. (Radio.) A commentary about my chance interview with then-Senator Barack Obama. A multi-media piece covering American Muslims’ opinions of President Obama at the first-ever Democratic Muslim Caucus in 2008. What is the most pressing youth issue? A radio ‘vox-pop’ polling young people about what issue concerns them most in the 2008 presidential election. During 2010, I was a freelance writer for What Kids Can Do, a non-profit organization that promotes the ideas and work of young people by supporting the organizations, projects, and adults that serve them. I produced a multi-media series about summer learning, in addition to short articles highlighting successful youth-driven organizations across the country.